If everyone in the world woke up tomorrow and said “I’m a feminist,” nothing would automatically change. Progress comes from what we do, not what we are. 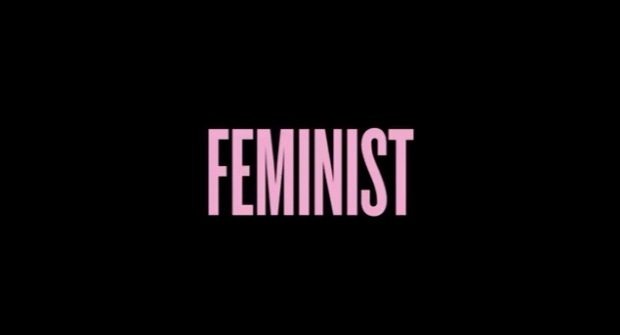 It’s hard to define the exact moment when being a feminist went mainstream, but it might have been when Beyonce performed in front of the word FEMINIST in giant glowing letters at the 2014 VMAs. Later that year, the Telegraph’s Alice Vincent wrote that “in 2014, perhaps for the first time, [feminism] became cool.” Now, pretty much every famous woman in the world – and more than a few famous men – are constantly fielding questions about, not their nuanced thoughts on the need for women’s liberation, but simply whether or not the word “feminist” is one they use to refer to themselves. “Serena Williams is ‘definitely’ a feminist,” says the Independent Online. “Emma Watson: feminist to the core or a carefully polished brand?” wonders The Guardian. Rihanna wears a “We Should All Be Feminists” T-shirt, which donates a portion of sales to her non-profit organization. And the star-studded cast of Feminist: The Eternal Musical is rounded out by a huge and growing population of everyday people. “YES: The Majority of Teen Girls Now Identify as Feminists,” trumpets Glamour. There isn’t a lot of nuance in this discussion. Either you are a feminist or you aren’t, and the distinction rests entirely in whether you call yourself one. We discuss whether books, movies, and television shows are or are not feminist. Dearly departed women’s website The Toast even had a short-lived series called “Is It Feminist?” which evaluated pop cultural occurrences of the word “it” from Stephen King’s novel to the giant disembodied brain in A Wrinkle in Time and gave them numeric scores for their total feminism. I love the word “feminist.” I first encountered it around the second grade, long before my politics had any shade of nuance or complexity; I embraced it ardently and never let it go. But these days, I have to admit that I’m getting a little tired of how much space it takes up. This discussion reduces feminism to an easy binary – something you are, not something you do. While I’m by no means an opponent of identity politics, and there are many instances in which organizing around recognition of a shared identity is transformative and powerful, using that framework to refer to feminism seems counterproductive. And it gives rise to circular and unsatisfying arguments between self-identified feminists at political cross purposes, where we all (because I’m guilty of this too) try to take each other’s imaginary feminist card away. There are myriad political and activist groups that describe themselves as feminist, some of them completely irreconcilable. And of course there are also those whose engagement with social change begins and ends with calling themselves feminists (a category I’ve certainly fallen into at some points in my life). It’s not necessarily that it’s incorrect to apply the same word to all of these people; it’s just that it’s not very helpful. If you say “I’m a feminist,” that’s kind of like if I ask what you like to read and you say “Hardcovers.” It doesn’t really give me the information I’m looking for. If you call yourself a feminist, that doesn’t automatically mean we share goals or strategies. And if you’re not a feminist, that doesn’t mean we can’t work in solidarity. Many women belonging to marginalized groups that mainstream feminism has traditionally excluded – I’m thinking of black women in particular, though there are plenty of other examples – eschew that word, but our beliefs and goals might still overlap considerably. I want people who believe in liberation, feminist or otherwise, to talk less about what we are and more about what we do. Let’s talk about our verbs instead of our nouns. What do we hope? What do we fight for? Who are we helping? What are we learning? The women on the forefront of popular culture have been successful in making the word “feminist” palatable, and even a badge of pride, for today’s youth. But is that an end in itself, or the first step toward some grander goal? My high school creative writing teacher told me, “The weakest verb is ‘be.’ Use something stronger.” “Be” just sits there on the page. It doesn’t go anywhere. It doesn’t change anything. I don’t just want to be feminist; I want to fight feminist, build feminist, grow feminist. Maybe if our feminism had more verbs in it, we’d have fewer conversations about whether this or that celebrity is really a feminist, and more conversations about how to increase abortion access, close the wage gap (particularly for black and Latina women), and end violence against trans women. If everyone in the world woke up tomorrow and said “I’m a feminist,” nothing would automatically change. Progress comes from what we do, not what we are. I think the real reason “is she feminist” debates make me cringe is because they remind me that I, too, have been guilty of letting “being feminist” stand in for doing the real, hard work to root out and defeat misogyny. I need to be less and do more. Maybe you do too.